Cars are obviously a great luxury but they can truly test your patience by faltering at the wrong time. The biggest fear of car owners is the moment when they sit in their car and try to start it but the car doesn’t respond at all. Your level of frustration would obviously know no bounds when the car won’t start clicking. However, you shouldn’t start worrying anytime soon if you find that the car won’t turn over just clicks. Your car might not start for a wide variety of problems but the good thing about it is that every problem has a viable solution available. The solution to every problem that might stop your car from stopping is known to car mechanics. However, that shouldn’t stop you from knowing the root cause of the problems that plague your car yourself as knowing about the problems can help you take measures in avoiding the problems in the future. When you put the key in the ignition and turn it, the battery provides the initial charge to the starter motor which gets the engine running. If you turn the key and the car won’t turn over just clicks, the most common reason for it would be a battery issue. And the most commonly occurring battery issue is that they die out. To see if that is the case or not, you should know the procedure of checking car batteries. When a car doesn’t start clicking, a dead battery is the most probably cause. This tends to happen normally because people simply leave their headlights or the backlights on. Since the lights are powered by the battery, if they are left on for too long without the battery being charged, it tends to drain out. Some fault with an electrical component of the car can also cause battery drainage. It’s also possible that the battery dies out after completing its life. In such scenarios, the battery simply doesn’t have enough power to give initial power to the starter motor. If you would pay close attention, you might be able to hear a slow clicking noise when you try to start the car which would indicate that the battery’s charging is low. The simplest way of checking if the battery’s dead or low on charge is to turn on windshield wipers or the headlight. If the wipers move too slowly or the headlight is too dim then it’s the battery that is at fault. If you bought the battery a few weeks or a couple of months ago, you should be able to recharge it again. The easiest way of doing this is to jump start the car and then keep the engine running, so that the battery can get charged. If this doesn’t work, then it would indicate that you either need a new battery, or need to get your car’s charging system checked. If the battery is old, then you would most likely need to buy a new one. Meanwhile, if it’s new and still not getting charged, there might be an issue with the charging system. If you find out that the battery is working just fine but the car not starting clicking, there might be a different problem in play. Here are the most probable of those problems. Check the Fuses: It might be a simple problem like a fuse malfunction which might be causing the car not starting. Fuses are often placed alongside the starting systems for protection purposes and if the fuse blows up at any point, it would make the entire system useless. 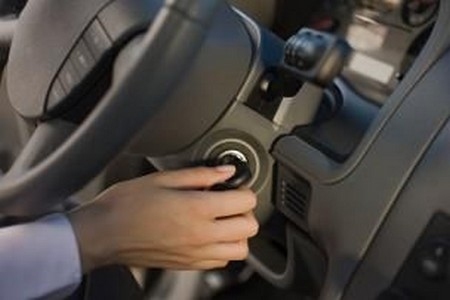 Ignition Switch Malfunction: A malfunctioning ignition switch can also be responsible for your car not starting clicking. The best possible way to check this is to turn your key in the ignition (don’t take it to the starting position) and see your dash for the red warning lights. If they do not light up and you have already cleaned the battery connections, then your ignition switch might be the one to blame. In case the lights turn on, it’s possible even then that your ignition switch isn’t functioning properly. To be completely sure, keep the headlights on and then try starting the car. If the lights don’t turn off entirely, your ignition switch is at fault. If they turn off, there’s no problem with it. Dirty Battery: The battery is placed under the hood and if your car not starting clicking, you should take a look at the connections of the battery. The connections often accumulate dirt and corrode with time too, so there is a possibility of the battery getting detached from the car. So, you should try and clean all the dirt and reaffirm that the battery is connected before searching for any other problem. Improper Connection of Starter: It’s not just the battery which can be affected by corrosion. Any electrical component which is even slightly exposed can get corroded. Starter is one such element. You can check for bad connections by asking a helper to turn on the car while using a tester to check the connections of the starter. If you find that current is flowing but the start isn’t spinning, you might need to get the starter replaced. Server responsed at: 04/22/2019 8:52 p.m.